Editor's Note: This is the first in a three part series on the Orrville football uniform. Part 1 will explore the uniform set as it currently exists. Part 2 will deal with potential changes and tweaks. Part 3 will look at the current helmet and present potential changes in design and colors. "The uniform makes for brotherhood, since when universally adopted it covers up all differences of class and country." If you've read this site for any amount of time, you have read my penchant for uniform details. Well, this is me totally falling off the wagon. 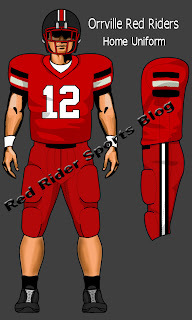 In the following post, I will break down the Orrville football uniform, as it currently exists, and in future posts I will discuss potential changes in both the uniform set as well as with our helmet. Just so we're clear, merely a suggestion does not mean an endorsement. I may present something that I myself hate, but I know that my taste isn't your taste, so I will present all sides of the argument and allow you to see it in living color before passing judgement. Visual aids will be used for the reading impaired, or the lazy...or both. If minute, borderline-obsessive details regarding football uniforms makes you a little uncomfortable, it's best just to skip this post altogether. Allow me to channel my inner Paul Lukas. Adding black pants during the 1992 season. Using the small skull stickers exclusively beginning in the late 80's, ending the use of the large die-cut skulls. That's it. No large scale changes or complete redo's....and I couldn't be happier. I think most would agree that the uniforms are very sharp and simple, albeit a little boring. But still very classic and laced with tradition. Do I think the uniforms are fine as they are? Absolutely. Do I think some small changes could be made to make them even better? You Betcha. Do I love answering my own questions? You know it. Let's look first at the uniforms as they currently exist. All pictures can be increased in size by simply clicking on them. 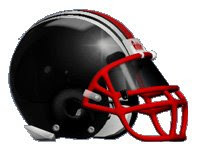 Classic gloss black helmet, Red stripe down the middle, and two divided white stripes on each side (the total width of the white stripes is equal to the width of the red stripe). Red face mask and skull pride stickers. It seems in the Doug Davault era that the stickers have been applied more uniformly. Gone are the days where players make a number or some other design out of their stickers (beautiful evidence here). Big thumbs up on that move. Stickers seem to show up on the left side of the helmet first (see here), a nod to Ohio St. obviously. We'll discuss the helmet in much more detail in a later post....now let's get to the uniforms. Red jersey has a divided triple stripe sleeve design (black/white/black) with white "varsity" block numerals outlined in black. The red pants have the familiar "black-white-black" triple stripe down the leg, matching the red jersey stripe pattern. As mentioned above, the black pants were added in 1992, and from what I was told, we got beat pretty bad at home in the black pants debut, prompting Coach Mac to make the black pants "road only." Recently, we've returned to wearing the black pants at home. I want to think the black pants were added out of necessity more than anything else. One pair of red pants had to be tough to keep clean throughout the season, although I can't think of any other county team with more than 1 pair of pants. My problem with the black pants is this....they only have a two stripe design (red/white). This bothers me to no end. Not sure why this was done this way, when our jerseys and our red pants utilize the "triple stripe" design. Why not follow the standard that's already been established? I have noticed that every game we play against Wooster, we wear the red pants. I'm pretty sure we've never worn black pants for a game against Wooster, at least under Coach Davault. I think this is another nod to tradition and I support it 100%. Probably the toughest area of the uniform to standardize...but it seems that the black socks and black shoes combination is becoming the norm. If you want to get real crazy and layer black socks over white (or white socks with black tape) Ted Ginn style, all the better. The more "spats" the better should be the rule going forward. This is the only real difference (obviously) between home and road uniforms. The white jersey has the same triple sleeve stripe design (black/red/black) with red "varsity block" numerals outlined in black. 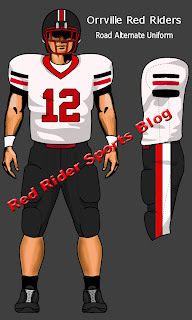 Red Pants or black pants can (and have) been worn with the road white jersey. Note: The above image templates were found on the South Carolina Football message board "Cockytalk." If you would like to use any of the Red Rider templates, all I ask is that your credit my site as your source. Great Job first off on part 1! Our uniforms like you said are very classic, traditional, and in some ways boring. 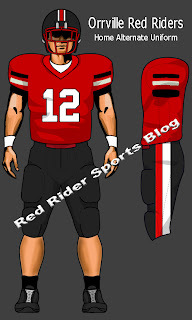 If I could change some things about them I would first off change the black pants to triple stripes, then add a black jersey to go with it(just like our red and white jerseys only black). In addition to the jerseys I would contrast the red jersey with a white collar, and white elastic at the end of the sleeve, red contrast to the white uni on the collar and sleeves. Then I would add 'ORRVILLE" across the front of the jersey in the same block letters like the numbers we currently have. I love our helmet like it is, very intimidating and sharp! Thanks for taking the time to write....we'll discuss a potential black jersey and jersey lettering in part 2.
i agree with you on the helmet...adding any logo would make the pride sticker look sloppy as you would have to place the stickets around the logo. The perfect example of this is Steubenville....nice red helmet with a block 'S' but it looks terrible once pride stickers start surrounding the logo. I think that during the 1988 campaign they had the "rider jumping through the O" logo. Another bad idea by Coach McWooster. Are you serious? On the helmet? I'll need to investigate this....post haste. We wore black pants at home in the in the '97 and '98 season, up until the CCC game in 98, which we wore all red and continued through the playoffs(which left us in white and black for the state game). Only reason being was my dad said something about never wearing the all red uniforms anymore. Since there was only 2 captains that year, was an easy vote. Coach Mac didn't pick the uniform colors, at least when I was there. Thanks for the comment. Nice to know the shop class was also the de facto caretakers of the football helmets. I vividly remember the debut of the black pants in 1992. Many on the team had been pushing for black pants for awhile, but the change came as a surprise. We actually went out for warm-ups in the reds and when we came back to the locker room the black pants had been laid out for us to change into. Of course, as you mentioned we did lose that game and didn't wear the black for awhile. At some point we decided that we liked the look of the black pants with the white jerseys rather than the reds, which is why we went with the white/black red/red combos through at least the 1993 season. I'm still partial to the red/red look rather than red/black. I attended the Orrville/Mansfield Madison game as well as every other game this year with the exception of Copley and last Friday it finally dawned on me that this football team has absolutely no discipline. Gone are the days of tucking your shirts in and leaving your helmet on when standing on the sidelines. I can tell you that when I was in school these were things that were not only suggested, they were a must or you were not be a part of the team. I will give Orrville this, they are very talented and have the potential to go a long way this year, but lack of discipline is the reason they are in a must win situation this Friday against Clearfork. Suspensions were a big part of the first two losses and were not excusable. The coaching staff is non existent and just lets this team do whatever they want including many cheap shots that result in stupid 15 yard penalties. Maybe thats why there is a huge dropoff in attendance and the Orrville faithful doesn't travel to road games like they once did. Example of this was the 50/50 drawing at the Madison game was for $54.00. Are you kidding me? Where are you Riders fans? 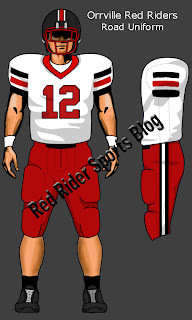 Or are you tired of seeing an undisciplined display of what used to be Red Rider Tradition? thanks for leaving the comment...I wish I had a way to communicate back with you (other than the comment feature)...because you bring up some solid points. The attendance is a combination of Orrville football just not being what it once was, and the distance that some of these away games are. The shortest drive is Wooster, other than that, it's a minimum 30 minute drive, and sometimes as much as 1 hour+....and the weather has been crappy too.....but your larger point is yes...we dont travel as a fanbase like we used to. I dont see cheap shots, but I do see poor decisions leading to penalties....and poor decisions leading to penalties...and poor decisions leading to turnovers. We seem to continue to get chance after chance to make the playoffs, and I hope the kids can go to Clear Fork to take care of business....because those chances will run out soon. And a much hyped class of seniors will go out with no even a taste of a conference title or a playoff game. What does Orrville run now, offensively and defensively? I have been gone from Ohio for awhile now, but I like to keep tabs on them still. My uncle, former Rider Jimmy Johnson also keeps me informed. I still have the helmet i wore my senior year, as well as my red jersey. being in the military i have missed the last five seasons and it bugs me that i have, but i plan to return for a game of the 2011 season, partly to watch my brother play at Northwestern and to see my alma mater play somewhere! I was always a huge part of the red rider football program starting with the 1995 season as a "ball boy" and ending with the 2004 season as a senior. i still get chills up and down my spine every time i hear "lunatic fringe" playing on the radio. Red Rider Football has always had its roots deep in tradition and im glad i was a part of it, as a coach's son, a ball boy, and as a member of the varsity squad! Just out of curiosity, could you find out the back story of the Mike Evans pride and desire award, and maybe the list of recipients, i know i recieved it for the 2004 season, and it was a huge honor, but i didnt know how it was started and why and who i joined as a recipient! thanks!